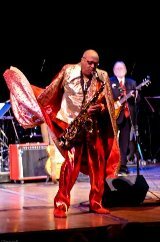 GRADY WAS SAXOPHONIST AND BANDLEADER for Peacock Records' Don Robey when he met Little Richard and became leader of the Upsetters. They recorded many classics like "Long Tall Sally", "Whole Lotta Shakin Goin On" and when Richard (temporarily) retired, Grady was hired by Sam Cooke to lead his band. 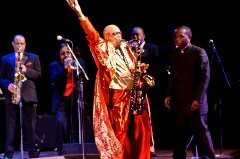 After Cookes' death, Grady continued to play all the great houses like The Apollo and the Palladium, backing up Diana Ross, Gladys Knight, Bo Diddley, Etta James, Jackie Wilson and many, many others. Let Grady Gaines liven up your party! When Grady came off the road he returned to Houston for some years but the force of disco in the 80's moved Grady to tour Europe, and to play festivals. Starting again in the early 90's, Grady re-formed the Upsetters and has been playing private parties, clubs, and festivals ever since. His music is authentic, soulful and represents the best music from 6 decades - Grady is the real deal. Some of the atomic energy that Little Richard emitted nightly during the mid-'50s must have spilled onto Grady Gaines. As the hardy tenor sax blaster with Richard's road band, The Upsetters, Gaines all but blew the reed out of his horn with his galvanic solos. He wails with the same unquenchable spirit today. Check out Grady Gaines music and biography.